This is another great little pattern that was published long enough ago to have passed into the public domain, at least in the United States according to Cornell University. 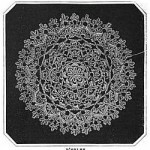 Like most patterns published in the late 1800s and early 1900s, the designers assumed the crocheter had enough skill and knowledge move from one row to another. I have totally rewritten the pattern to make it easier to understand and to include those stitches that were assumed by the original designer. 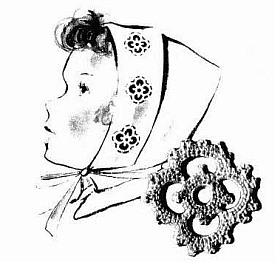 The original designer intended for this motif to be worked in fine crochet thread. The stitch counts and overall design work with any size smooth yarn or thread. I think it works up much prettier in thread. As you can see from the picture above, yarn size greatly impacts the finished size of your crochet motif. The purple yarn is standard 4-ply acrylic and the red motif is made from some unlabeled crochet thread that I had in my stash. Enough talk, here’s the pattern. This pattern uses a picot stitch which is made by making a chain of 5 crochet stitches and then making a slip stitch through the first stitch of the chain. BASE ROW: Make a chain of 8. 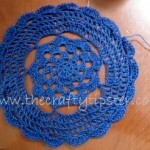 Slip stitch to the first stitch to form a circle. 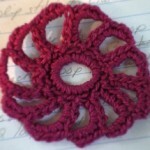 Make 20 single crochet into the circle. Join with a slip stitch. ROW 1: Single crochet into each of the first three stitches of the Base Row. Repeat the following 3 times – (1 picot and 5 single crochet into the next five stitches on the circle). Make a picot and finish row with single crochet in the last two stitches of Base Row. Join with a slip stitch. ROW 2: Single crochet in next stitch, 11 chain. Single crochet in third stitch after next picot (chain arches over the picot). Make an arch over all four picots of previous row and slip stitch last chain into same place as you started this row. ROW 3: Make 17 single crochet in each arch from Row 2. Don’t join. ROW 4: This row is worked into each of the single crochet stitches on the arches but skips the first and last stitch of each arch. Make 3 single crochet and a picot four times, finish the row with 3 single crochet. Slip stitch into 2nd stitch of first arch to join. Finish off. When crocheting into the ring or over the arches, shift the stitches to sit next to each other and spread out evenly over the chain. Don’t allow the stitches to sit on top of one another. 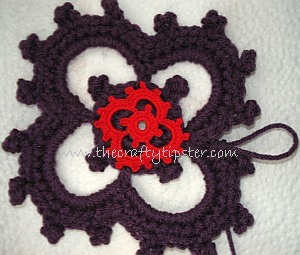 This will keep the crochet motif lying flat and make it look nicer.